Containing a wealth of inspiration for any textile artist, Small Art Quilts shows you how to create gorgeous, textured pieces of textile art. Using colour and an intriguing mix of surface techniques, layers, piecing and simple stitching, Deborah O'Hare's beautiful small art quilts capture the magic of her themes and subjects. In her unusual, whimsical interpretations of nature and the landscape, she builds up torn and cut layers of coloured cloth with stitch to create beautiful works of textile art. With her fresh, innovative approach, Deborah provides inspiration and step-by-step instruction on all the techniques she uses and shows the reader how to create moonlit scenes, seas, flowers, meadows, mountains, moors, animals and birds. 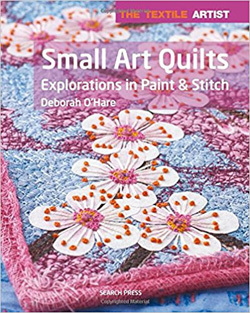 From an original idea through to finishing and embellishing this book will offer a rich source of ideas for experienced art quilters as well as those setting out on their creative journey who are inspired to start small. This product is not included in any discounts.